Due to many of its members venturing out and starting their own clubs during the Bruce Lee, boom years. The well-established Portsmouth club had many associated clubs working close with it. As mentioned, the Portsmouth Karate Club (the name was changed from Portsmouth Shotokan to avoid confusion with a small breakaway group who chose to call their club by the same name!) was a member of theKUGB. The notion of a new association was mooted and before long a meeting was planned and representatives from the associated clubs were invited in order to discuss the situation, the main point of the agenda being the formation of a locally based association. On the evening of 2nd April 1982 – twenty two associated clubs who over the years had direct links to Mick Dewey and the Portsmouth Club met at 74 Hawthorn Crescent, Cosham, Portsmout, the home of Mick and Maureen Dewey. By the end of the meeting, 20 of the attending clubs had voted to form a new organization in the South and, the South of England Karate Union (SEKU) was born. This changed some years later by popular vote to the Shotokan of England Karate Union. It was very sad to have left the KUGB, particularly for Mick Dewey as it meant leaving an association that at the time meant so much to him, worse still his instructor and mentor Keinosuki Enoeda Sensei, would not be able to visit the Portsmouth Dojo in an official capacity any more. 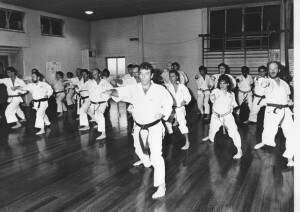 Mick had spent several years as a member of the KUGB team squad coached by Enoeda Sensei and Andy Sherry. The Team Squad at that time consisted of such eminent members as Terry O’Neill, Billy Higgins, Bob Rhodes, Bob Poynton, Dave Hazard, Mick Wragg, Jimmy O’Grady, Joe Farley and the late Steve Cattle. The Team traveled to Tokyo, Japan in 1977 for the IAKF World Championships staged at the Budokan and took third place and a bronze medal. In 1980 Mick was a member of the Gold medal winning KUGB Team at the European Championships in Brussels. When the British team squad returned to the UK from the IAKF World Championships, Mick remained in Japan in order to spend time training at theJapan Karate Association (JKA) Headquarters in Ebisu, Tokyo. 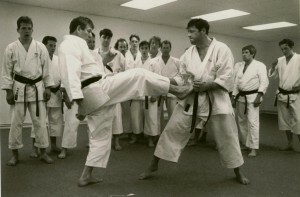 He stayed at the apartment of his long time friend Dave Hazard who was at that time living in Tokyo and training at the JKA. The first SEKU annual championships staged at the Mountbatten Centre Portsmouth, was a resounding success. Summer training courses held on the Isle of Wight annually were also very popular. SEKU was a happy outfit and things were going well, grading examiners led by Mick Dewey were Mervyn O’Donnell, and the late Dave Hinks was later promoted to the same grading examiner status. In 1984, Mick invited his friend Dave Hazard to join the new outfit and Dave was very keen. It was however, the policy of SEKU that to become a grading examiner, you must be running your own club. As Dave did not have one, Mick negotiated with senior members of his own former club in Brighton for Dave to become it’s resident Instructor. Both parties were very happy with the arrangement and Dave moved into the area, successfully running the club for SEKU until January 2003. Mick had started the Brighton Karate Club (now currently being run by Jess Lavender for the ASK group) with Phil Elliott in June 1974, travelling from Portsmouth twice weekly and was its instructor until the inauguration of SEKU in 1982. It was then handed over to the senior members Will Davies, Paul Bonnett, Greg Wedekind and John Cave to carry on the good work, and so allow Mick to spend more time on promoting the new association. In January 2003, Dave decided to move on and form his own group and is now resident in Nottingham. Brian Smith, Instructor at the Lovedean Karate Club was promoted to Grading examiner, along with Jess Lavender at Billingshurst. Unfortunately, Jess chose to join Dave Hazard in his new venture. Dave Hinks retired from karate and his club in Eastleigh is no longer running. The association today is as strong as ever, and has affiliated clubs in Somerset, Devon, Cornwall, North Kent, the Isle of Wight, Hampshire and Surrey. SEKU believes that karate training is for all, with the membership ranging from all ages and abilities. Thanks to the leadership of Mick Dewey and fellow senior instructors, we have a good standard of Karate-ka throughout. We also have a good competition team squad who travel to many selected tournaments throughout the year, both in this country and internationally. 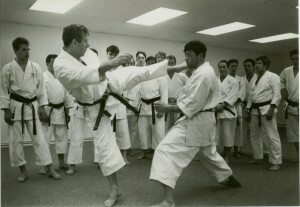 SEKU has a long history of traditional Shotokan karate and the teaching methods are taught virtually same way as that of Mick’s instructor Keinosuki Enoeda Sensei. The organisation has strength in depth, it has character and drive and the leadership has many years of experience behind them. They believe, that with that experience, the present and future generations of instructors will thrive and the future of SEKU will flourish.